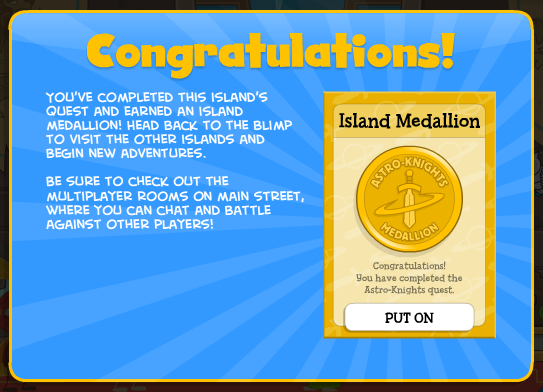 When you land on the island, you will be on Main Street, on top of a sign that says “Welcome to Arturus.” Get off of the sign, go right, and enter the building with a sign next to the door that says “The House of Mordred or Mordred’s Museum.” Talk to the poptropican with orange hair and he will give you a pamphlet and tell you that you need money to actually explore the museum. The pamphlet will give you background information about Mordred, so be sure to read it. Exit the museum and go right until you come across a fountain. In the second tier of the fountain, to the right of the statue, will be something glimmering in the water. Jump up ad collect it. It will be a golden coin. Keep going right, to the next area. You will then be on the grounds of the castle of Arturus. Go right and enter the castle. Go left, up the stairs, and onto the next floor. Go right and enter the first door you see. 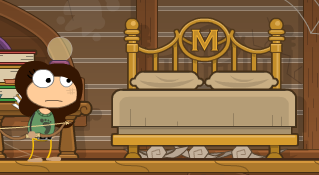 Go right and talk to the poptropican dressed in red with a beard. He will ask for your help. 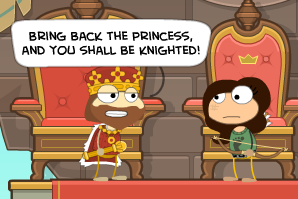 Now talk to the queen (the other poptropican in red) and she will tell you about the invaders and give you coordinates that three knights left before leaving to find the missing princess. Exit the throne room and go back down to the left. Go right once you get to the bottom floor and enter the door to the far right. You will be in the library. Go left, down the three steps, and keep going until you collect a book. The book will be called “The Life of Mordred.” This book has important information about Mordred that will help you understand the island better, so be sure to read it. Jump up onto the platform with the poptropican in brown on it and go left until you see a green sparkling book on a shelf. Collect it and read it, because this also contains key information. Exit the library and enter the door on the far left. You will be in the Lady in Waiting’s bedroom. 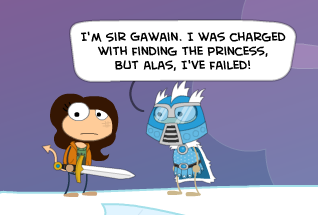 Talk to her (the only poptropican in the room) and she will tell you about the princess. To your right will be a mouse that runs away every time you try to get near it. Exit the bedroom and go back outside the castle. Go right and to the next area. 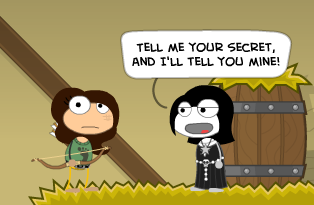 Talk to the poptropican holding a shovel, and he will give you a bag of manure. Keep going right, and to the right of Ye Olde Rumour Mille, on top of the ladder, will be a rope. Collect it and go back to the castle grounds. Go left and jump on the windows to get to a platform with a few knights and a crossbow. Click on your inventory and use the rope. Click on the crossbow and aim it to the upper left. The makeshift harpoon will lodge itself in the shutter of a window. Walk across the rope to get to the window and enter the next room through it. You will be in the princess’s bedroom. Go all the way left and a paper will be hanging out of a chest. Collect the paper and it will say that the princess made contact with Mordred, and that Mordred was keeping his secrets under his bed. Exit the princess’s bedroom and go to the museum of Mordred. Use the coin from the fountain and the orange-haired poptropican will grant you access to the rest of the museum. Go to the second floor and all the way left until you come across a bed with a lot of papers under it. Click underneath of the bed and you will collect a missing page. Click on one of the stacks of books, and the orange-haired poptropican will give you a library slip. Exit the museum and go back to the castle library. Go down the three steps and behind the first bookshelf, above a label that says “McM” will be a stone that is a different color than the rest. 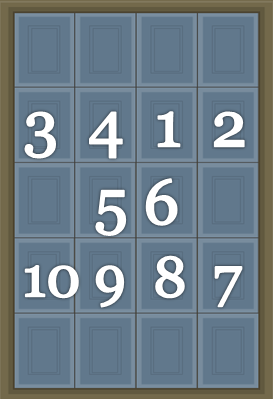 Click on it, and a set of stairs will open into the floor. Go down the stairs. You will be in a dungeon. Go right and collect the moldy cheese on the floor. Further right will be a lever on the wall. Click on the lever, and a small hole in the wall inside the cell will open up. Exit the dungeon, and the librarian and some knights will keep you from going back down. Go back to the bedroom of the Lady in Waiting and use the moldy cheese. The mouse will go to eat it and you will collect the mouse. On top of a chest will also be a piece of paper. Collect it and go to Ye Olde Rumour Mille. Enter the mill and use the tables and shelves to get to the girl in a black dress. Click on her, and you will give her the paper you just picked up. In exchange for the paper, the girl will give you the new password for the entrance of a secret order. Exit the mill and go back to Main Street. Go to the fountain and click on the square on it with planets and stars. Click on the different symbols in this order: moon, Saturn (planet with a ring around it), star, sun. The square will go down and reveal an entrance to a secret hideout. 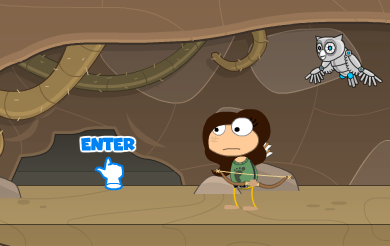 Enter the hideout and there will be a bunch of poptropicans in purple capes. Talk to the one all the way to the right, and he will give you a key. Exit the hideout and go back to Ye Olde Rumour Mille. Go left until you see two bales of hay. Stand in between them and push them apart to reveal a trapdoor in the ground. Use the key you just obtained to unlock it and go down. Slide down the rope and go left until the robotic owl flies out of Mordred’s hideout. Exit the hideout and use the robotic mouse you picked up earlier. Merlin (the owl) will eat the mouse and start following you. Go back into Merlin’s hideout and go left. 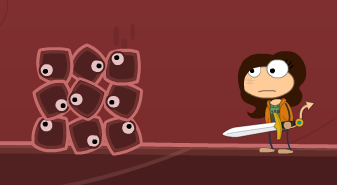 There will be a wall blocking your way that you will have to push against until it crumbles. Once it does, keep going left and enter through the hole near the floor at the end of the corridor. The robot inside the cell will self-destruct and a fuel rod will be flung outside of the dungeon. 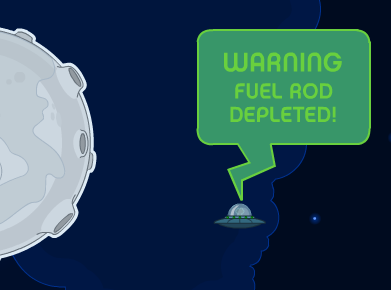 Click on Merlin and click on the fuel rod. Merlin will get the fuel rod and bring it to you. Exit the dungeon and the hideout. Go back inside the windmill and climb up the platforms trying to stay to the left side of the mill and jump on the gears until you’re on a platform in the middle of the windmill. To your right will be a rope. Jump on it, and the gears will now turn. Exit the windmill. Jump on top of the sign that says “Ye Olde Rumour Mille” and jump on the turbines. They will start moving. Jump on them as the move along (make sure they’re turning counterclockwise) until they open up an entrance to a secret room at the top of the mill. Enter through it. Inside of the room will be a hovercraft leaning against some hay bales. Use the manure and the hovercraft will fly out of the mill. Exit the mill and get on the hovercraft. Fly on it across the mud pit until you see a spaceship called Excalibur. Click on the space ship. It will have a broken and drained fuel rod in it that you will need to replace with the one from the robot in the dungeon. After you do that, the ship will power up. Put in these coordinates: x=56, y=52. Press launch, and you will fly into space. However, after a few minutes your spacecraft will run out of power and crash onto a nearby moon. The moon will be Pewter Moon. Once you land there, go right until you see a platform floating in the air. Jump onto the platform and then onto the building. Enter through the doors and talk to the poptropican to the left and he will tell you that you could build a rocket if you gave him the Excalibur. Exit the building and go to the platform on the ground with a sign that reads “Create your own rocket.” Click on the holopad console and it will bring up a menu for you to build your spaceship. Once you’re content with your rocket, exit the menu and enter the rocket. Click the lever that has the word “Launch” under it and go to these coordinates: x=15, y=15. You will be on the jungle planet. Exit your spaceship and go right, off of the platform. Make your way down to the ground and go right until you see the Laser Lance (see weapons book for details) and collect it. Use the giant springing flowers to get back to the platform you were originally on. There will be swinging platforms that you will have to use to cross to the other side. While you do this, watch out for the electric snakes poking out of the trees. Once you make it to the other side, go right, to the next area. There will be a green knight there and you will need to talk to him. He will tell you to get the princess from a cage to the upper right. Climb the rope next to him and jump across the robot phoenix eggs. Go quickly because every few seconds the baby phoenixes will pop out of their eggs and nullify your progress. Once you make it to the other side, you will find out that the cage doesn’t hold the princess but rather a cyborg unicorn. The mother phoenix will then arrive. You will have to fight her on the back of the unicorn. 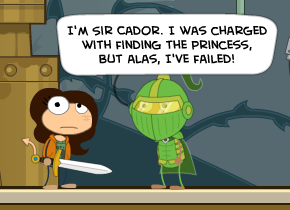 Once you defeat her, Sir Cador will tell you that he will come with you for the rest of your quest. Go back to your spaceship and go to 83, 20. You will be on the fire planet. There will be geysers pushing platforms up and down for you to go across. Try your best not to fall in the lava. Use the geyser platforms to get to the top of a volcano and enter it. Once inside, there will be a powerful gas blowing every few seconds and pushing you back. To avoid it, only go a little bit at a time and take cover in nooks or holes when the gas blows. Eventually you will get to a point when the gas stops blowing and you won’t need to be as careful. Once you get to that point, go left until you get to something that looks like rocks with eyes. When you try to jump over it, it will flatten out into a straight line. Jump widely to at least the middle of the line and try to make it over to the other side. Once you get past it, keep going left and there will be a red knight. Talk to him and he will give you an Ice Arrow (see weapons book for more information). Go to the next page and there will be a monster that looks like a mechanical dragon. You will have to defeat him using the ice arrow, the chains hanging from the ceiling, and the lever on his back. Once you defeat him, the red knight will join you on your quest for the missing princess. Go back to your spaceship and go to 73, 83. Before you can go to the planet, it is surrounded by space sharks. You will need to lead each space shark away from the planet and into a black hole (be careful not to get chomped by the space sharks or sucked into the black hole yourself). Once you get rid of the space sharks, land on the planet. Exit your spaceship. This planet is similar to the fire planet, put the platforms don’t move and it’s cold instead of hot. You must also watch out for mechanical piranhas jumping out of the water. Once you make it to the other side, go right. You will be at the base of a mountain. Climb up the mountain, watching out for snowballs. At the top of the mountain will be the last knight. He will give you a force shield and ask you to defeat the beast that bested him. For this monster, use your shield wisely and don’t waste it either. After you defeat the beast, Sir Gawain will join you. Go back to your ship and click on one of the knights. They will tell you about a legend about a key on an asteroid. Use your spaceship and go to 11, 82 (be careful about the asteroids). Click on the asteroid with a large crystal on it. Exit the spaceship and make your way up the crystals until you join the three knights. There will be a large key stuck in a part of the crystal. Click on it, and it will unlock a portal to a different galaxy. Enter through the door. The real princess will be stuck in a cell on top of a platform. Binary Bard will be in a robot. Merlin will appear, and for the first part of the battle you will use Merlin. The robot Binary Bard is in will drop small bombs. Use Merlin to pick them up, wait for them to begin to blink red, and drop them over the robot. While you’re doing this, avoid the spikes he sends out because those damage your health. Drop the bombs on the robot two times, and eventually Merlin will shoot him down. Now it’s your turn. Use the robot to get up onto the platform the princess is on, then onto the chandeliers on either side. Binary Bard will get under you and shoot a laser, causing the chandelier to fall on him. Do this with both chandeliers, and the green orb will fall off of the robot. The princess will keep him from getting the orb back, and you both will be brought back to Arturus, where you will be presented with your medallion.